I love doing my hair and but I have the hardest time when I have to brush my curly hair, Know matter if its in the shower or out of the shower. I always have to detangle my hair with conditioner or leave in conditioner. 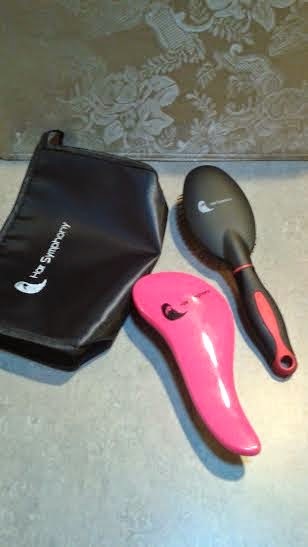 I am so glad to have received these two wonderful products from Hair Symphony. First I have the detangling bursh. I love this little thing, I always have to be patient when detangling my hair so It won’t break. So I detangle my hair when its wet some people say not to, because it breaks your hair but hey with curly hair it is a must. This detangling brush has a unique look with a handle, love that the bristles which are carefully alligned pins that are little far apart so it glides through your hair. You can use this brush also with dry hair. I start at the bottom of my hair and work myself up to the top of my head. Secondly the styling brush works very good after a nice detangle. You can also use this one without the detanling brush by doing the samething starting at the bottom and working up. But it’s prefer to always use a detangler before brushing your hair. 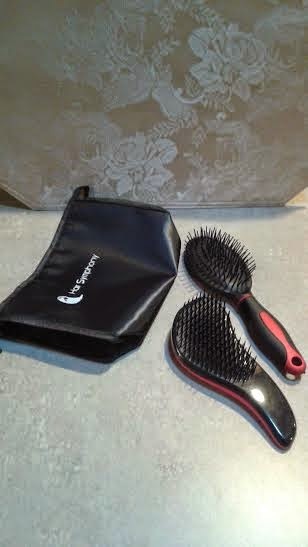 this Brush has a nice handle with grips on it so you can hold the brush comfortable it also has the soft bristles and you don’t have to press hard onto your scalp. It brushes your hair without damaging it. I am loving these wonderful products and they even come with a nice cosmetic travel bag that I can take any where I want. *I received this product in exchange for my honest and uand nbiased review, regardless I only recommend products or services I use personally believe will be good for my readers. All opinions are 100% my own.